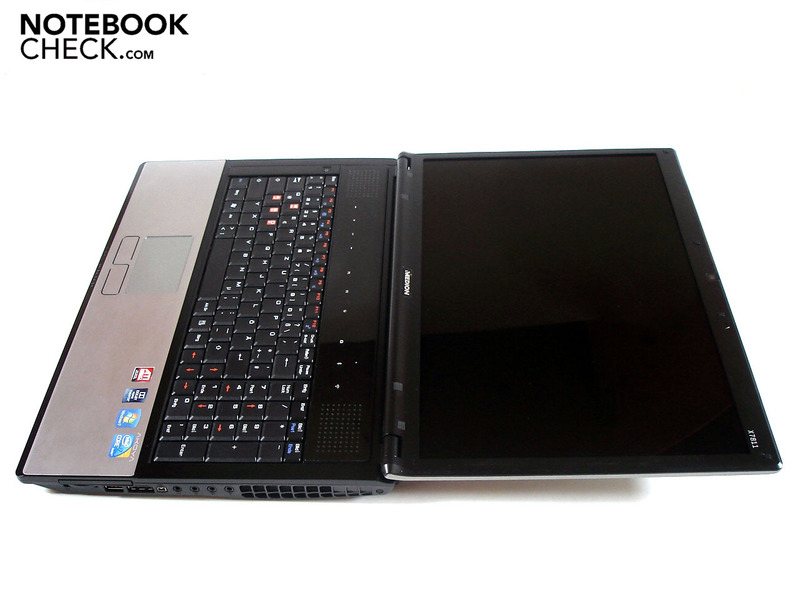 As Medion announced the Akoya X7811 at the Cebit in the beginning of March, we could hardly believe what we saw and heard: A gaming notebook with an ATI Mobility Radeon HD 5870 for 999 euro? There had to be a catch! 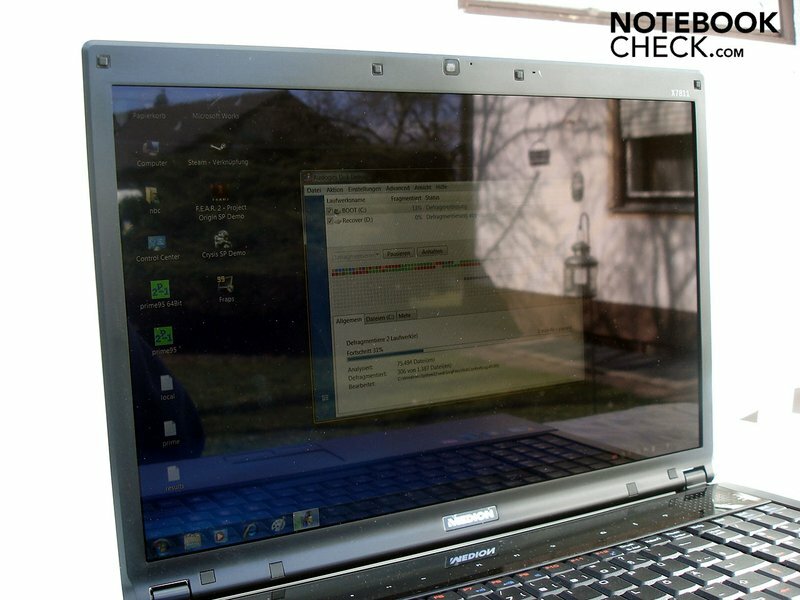 All previously available notebooks with a Radeon HD 5870, like the Asus G73, or certain Clevo barebones, like the Deviltech Devil 9700 DTX are significantly beyond that in terms of price and add up to at least 1400 euro with the operating system. The customer, however, only gets the minimum configuration with a dual-core out of Intel's Core i3/i5 range for this. 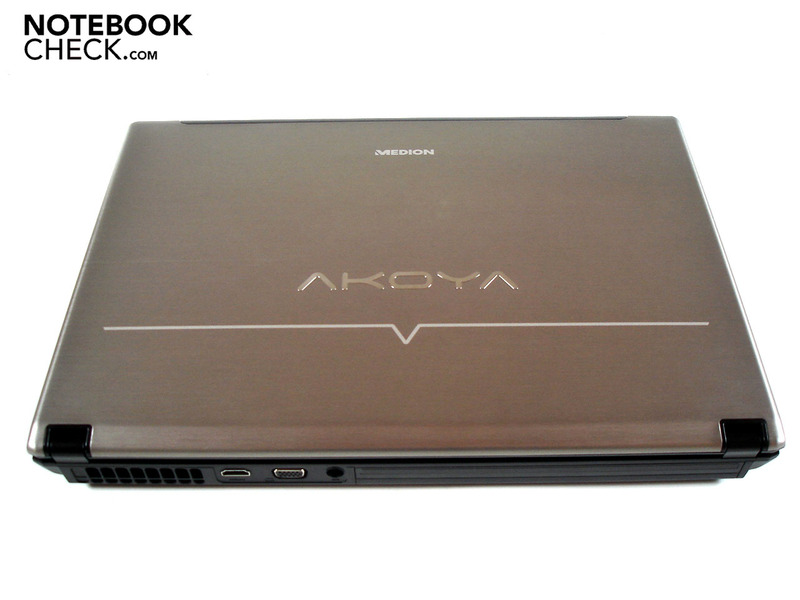 The Medion Akoya X7811 can, contrarily, serve with the quad-core Core i7-720QM already in the basic configuration. Therefore, we were in the same boat as the community, which has spent the last weeks in anxious expectation. After a subjectively endless waiting time, Medion has finally provided us with a prototype of the Akoya X7811, which we have tested thoroughly, as usual. Medion has obviously served itself from MSI and taken its 17.0 inch alternative. It has been used for MSI's GT725 and GT740, among others until now, and will also be used for the similarly equipped and feverently awaited model, GX740. A few advantages and disadvantages have turned up with the case's choice, which we would now like to list. A positive aspect is the fairly low weight of about 3.2 kg and the quite compact size of 395x280x42 mm. 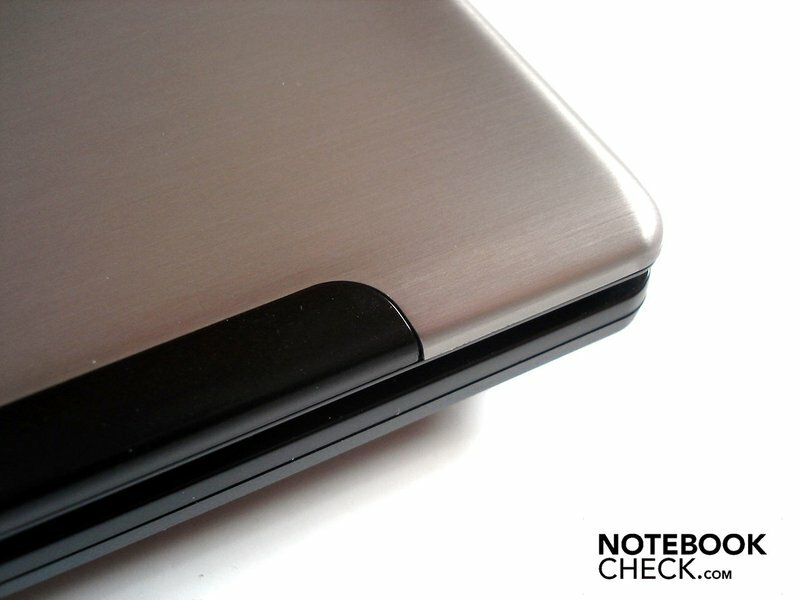 Additionally, there are the high-end surfaces of brushed aluminum that also barely smudge because of their silver color. 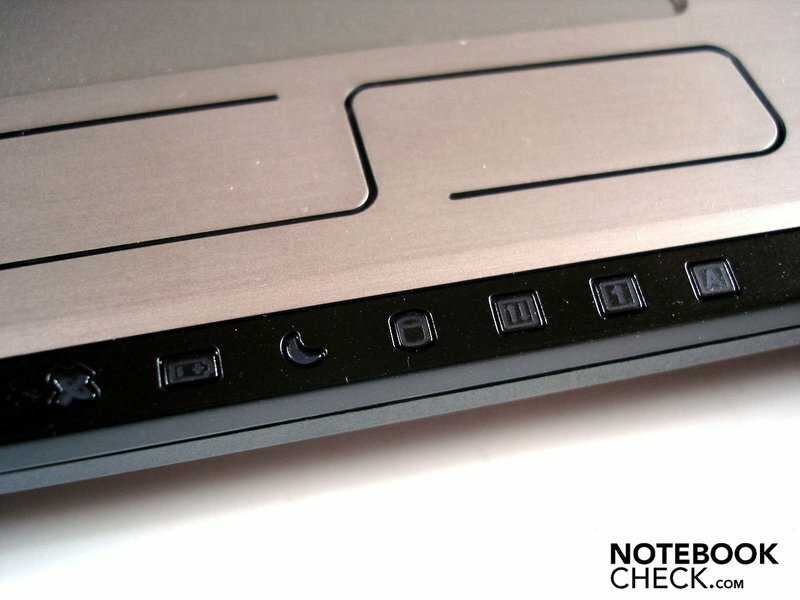 A unique feature is the magnetic lid closure, which we would like to see in more notebooks. However, the case has various drawbacks. The partly insufficient case stability can be mentioned for one thing. 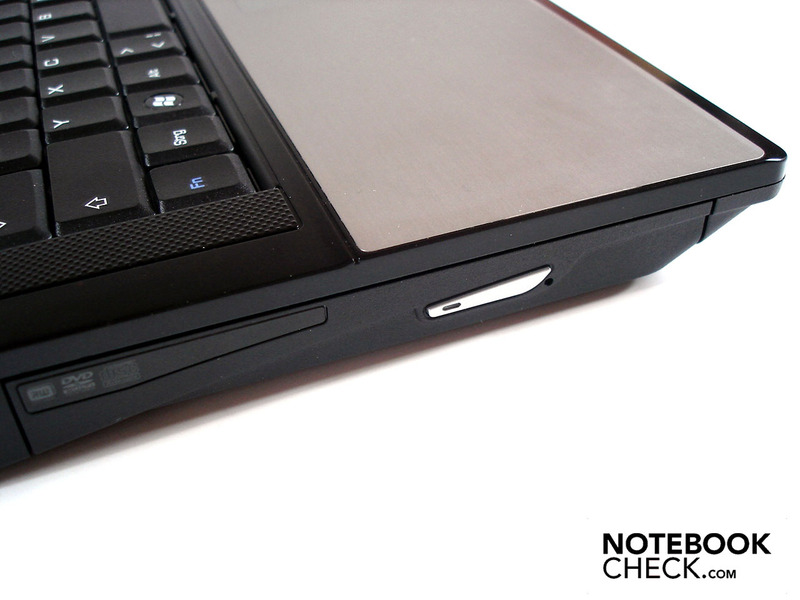 Thus, the wrist-rest, as well as the left keyboard edge, the drive slot and especially the sensitive multimedia bar yield notably. For another, the display is also not exactly a guarantee for stability, because the wobbly lid can be twisted evidently, which (just like pressure on the lid itself) can lead to image distortions. Furthermore, the hinges provide for a disagreeable base unit lifting when the display lid is opened. 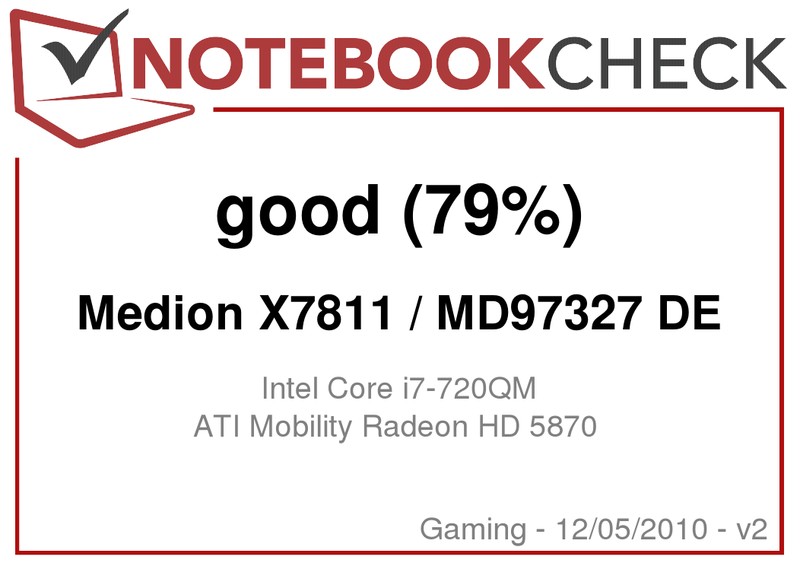 Whilst we were rather disappointed from the given connectivity in the last gaming notebook with a Radeon HD 5870, the Asus G73, the Medion Akoya X7811 can score especially well in this point. 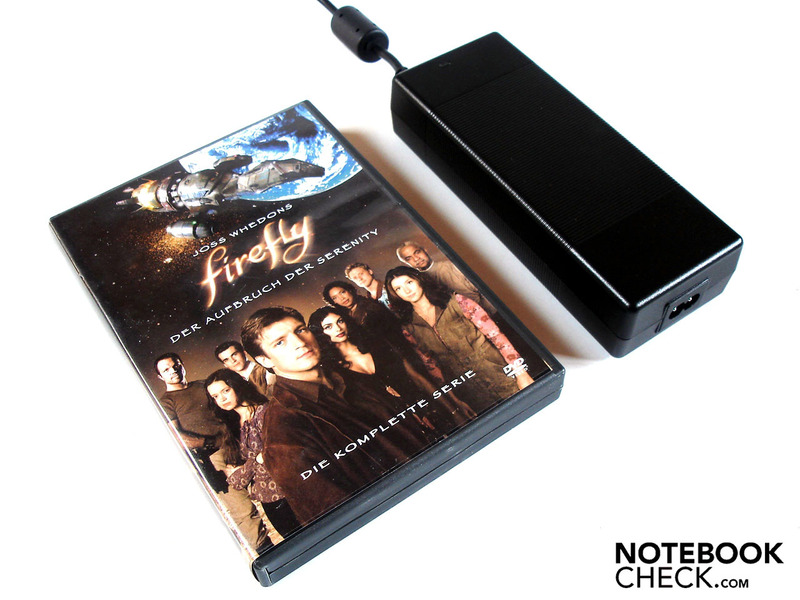 External monitors can be connected to the rear via VGA or, in terms of image quality considerably superior, HDMI. 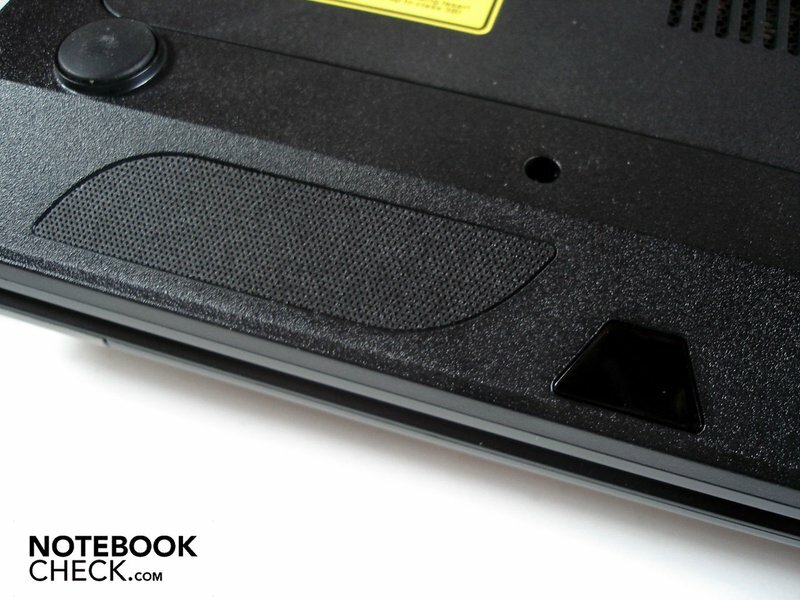 As often seen in big gaming notebooks or desktop replacements, the DC-in is also placed on the rear. We can't quite understand why the equally important network connection (RJ-45 gigabit LAN) is suddenly placed on the left. The port placement on the left is otherwise perfect. 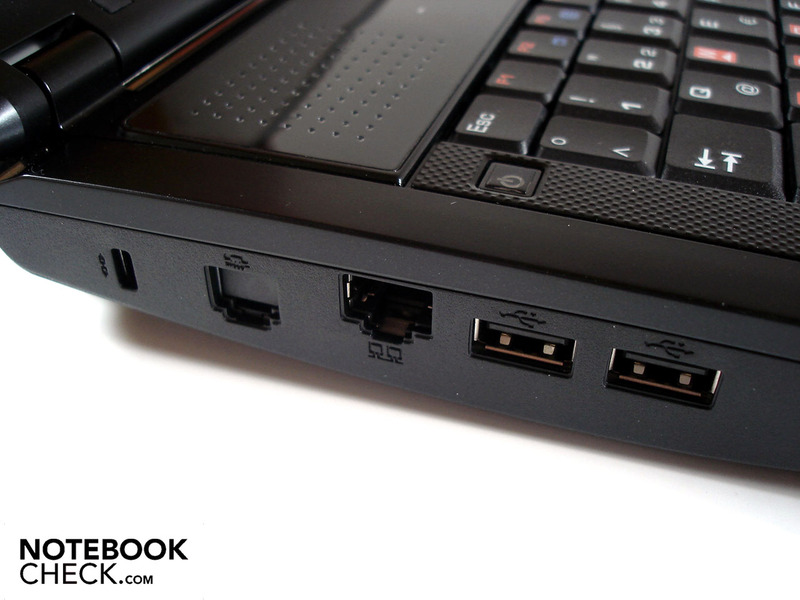 Thus, only the optical drive (DVD burner) is found on the front left half, followed by two USB 2.0 ports and a Kensington lock. In return, the port distribution on the right isn't as well-considered, in our opinion. On the one hand, the cardreader (MMC, SD, MS & MS Pro), the third USB port and the eSATA/USB 2.0 combo could be covered when the 54mm ExpressCard slot is occupied. 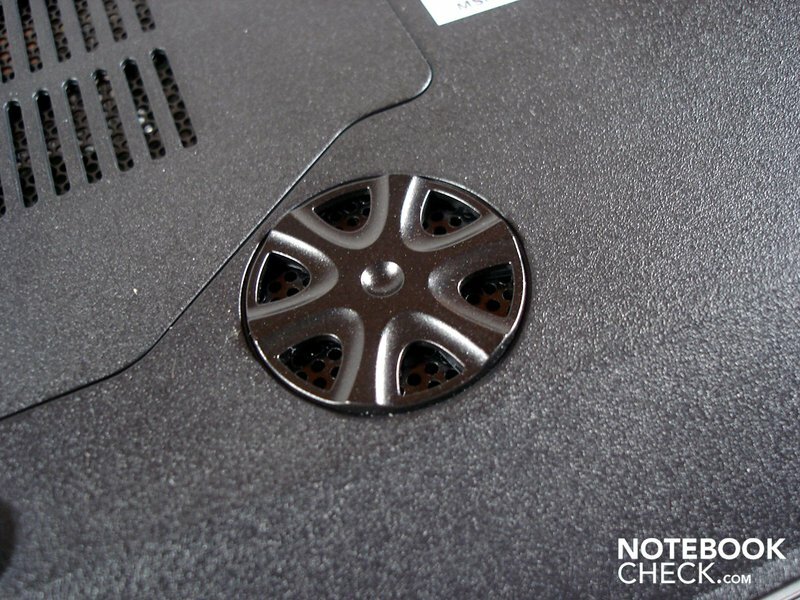 On the other, connected cables could get annoying if you use a mouse on the right side. 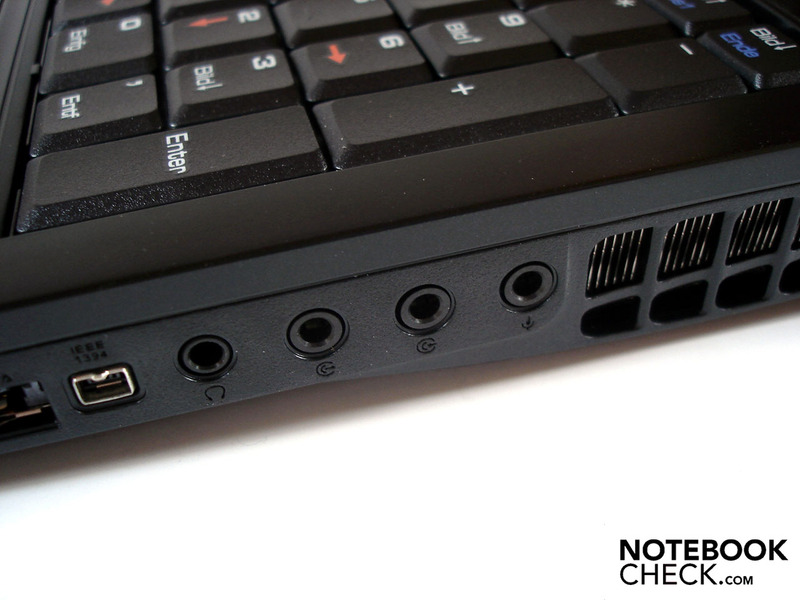 The same applies to the Firewire port and the four audio sockets (including a surround signal output), which can restrict the space on the notebook's side considerably. Because the case fan also emits a part of the warm air out of the right side, the hand warms up unpleasantly during mouse use. There isn't anything to complain about in view of the lavish connectivity. In return, the port layout doesn't seem to be quite as developed. In regards to software configuration, we had already equipped ourselves for an enjoyable uninstalling marathon a la Acer, Asus, Sony or Toshiba, etc. But, surprise: Medion has restrained itself halfway and forgoes on too annoying programs. Thus, the user has a pleasantly fast system within a short time that doesn't lose any performance unnecessarily due to numerous software. We are just as pleased about the more than generous supplies that we found in the package. 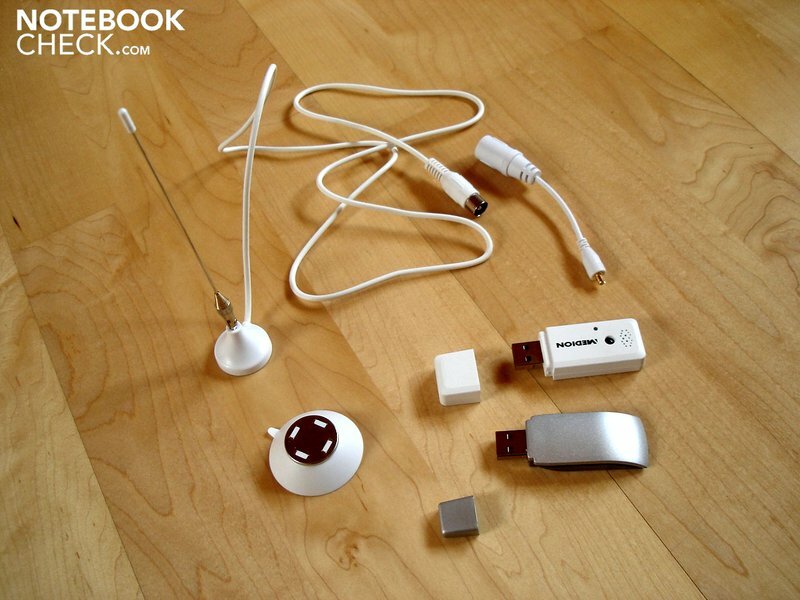 Medion adds, for example, a complete "TV set" to the Akoya X7811, which is made up of a USB DVB-T TV tuner, a small antenna, the corresponding cables and a user's manual. A thick manual, a DVD with Works 9.0, a driver and support DVD, as well as two further DVDs with the 32 and 64 bit recovery for Windows 7 Home Premium are also included. 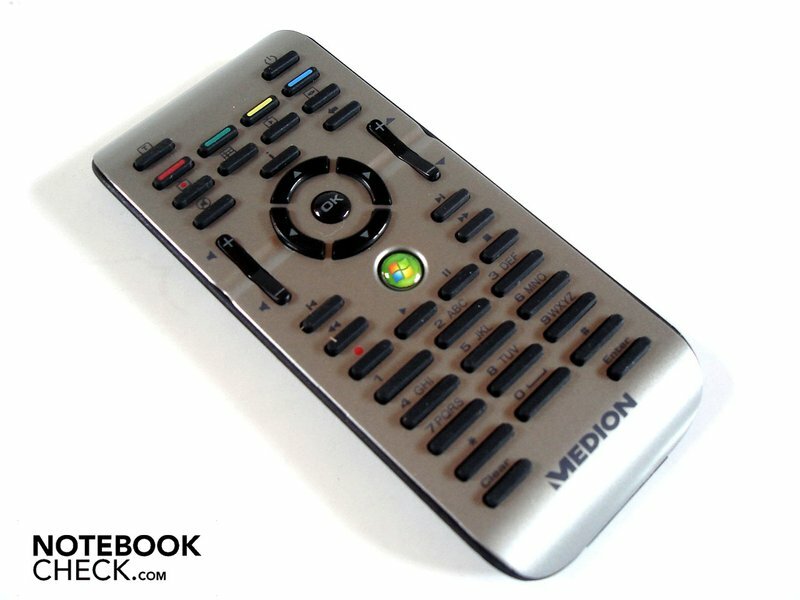 As if that's not enough, Medion also delights the buyers with an adequate remote control which keys, admittedly, have a low height. 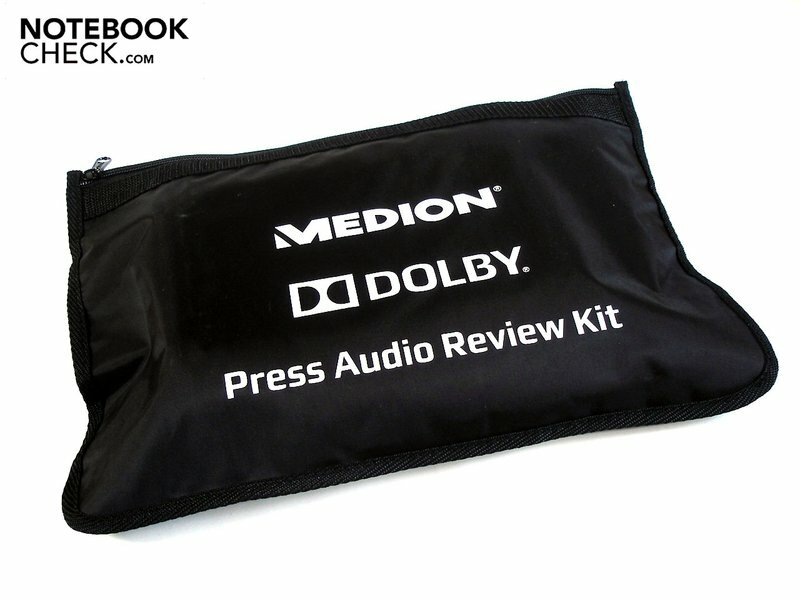 Above that, our prototype comes with a black case with a label "Press Audio Review Kit". 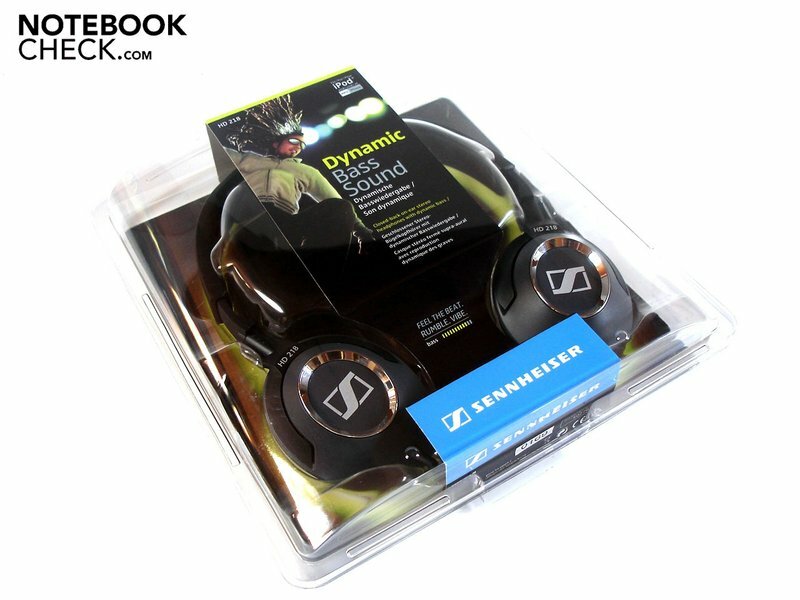 A chic HD 210 headphone from the sound expert, Sennheiser, is concealed in it. Even if the latter gimmick isn't included in the retail version, Medion outclasses its competitors with an unusually generous supply. 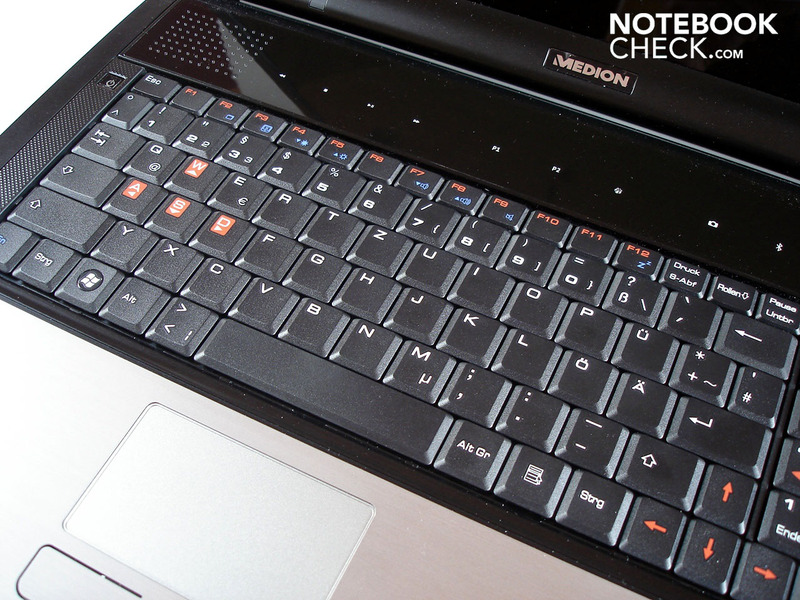 The keyboard is one of the biggest critique points on the Medion Akoya X7811 and is, frankly, an audacity. As in the gaming notebooks from MSI (e.g. GT640 & GT740) every aspect is actually a letdown. Starting with the vague and indistinct pressure point, which isn't lessened by the fact that the keyboard already bends under normal use. Additionally, the layout is half a disaster. 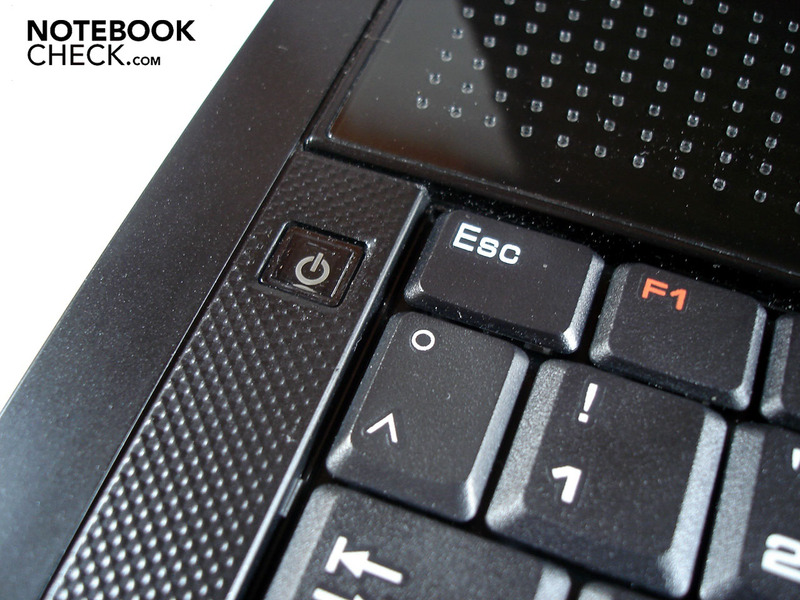 Thus, you are annoyed in games about the FN key positioned on the left. 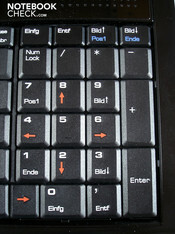 Furthermore, both the "><" key, as well as the "#'" key have been removed from their traditional place. The key size also has to be chided. 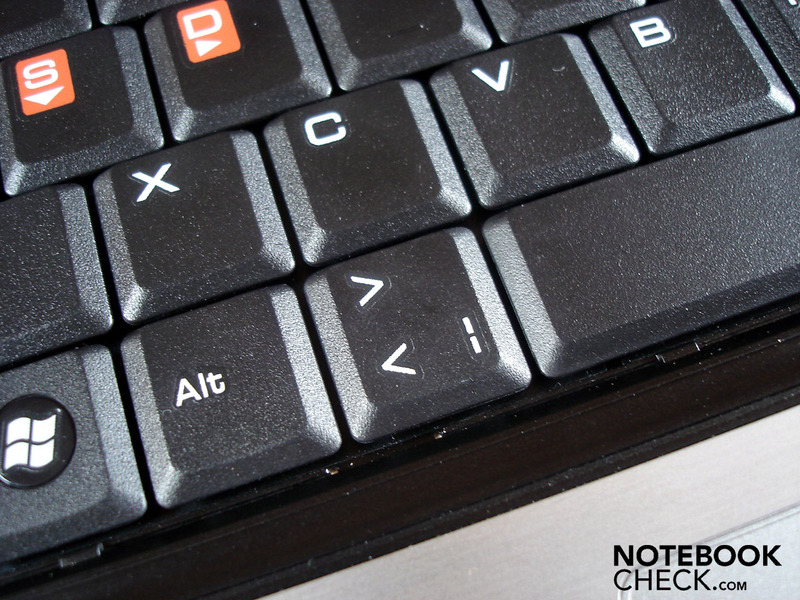 The "^°" key and "#'"key have turned out too narrow, just like the right shift and return key. 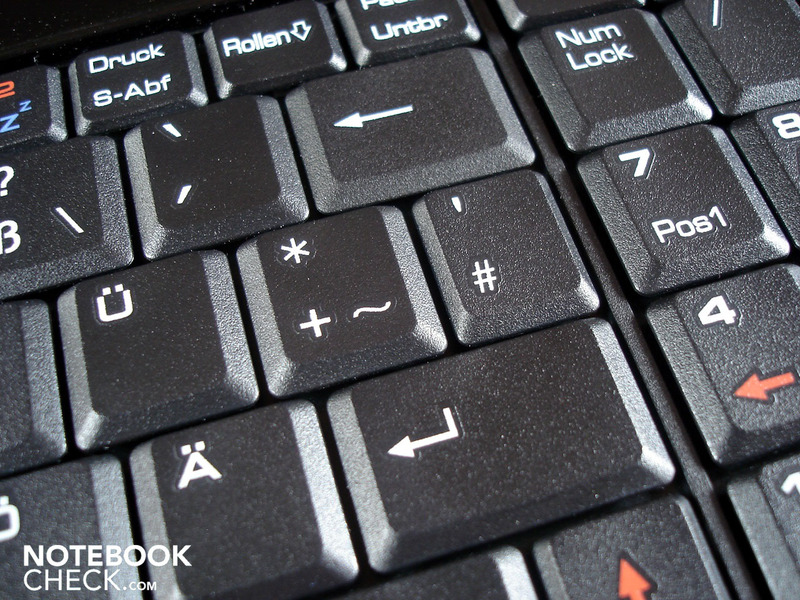 You also tend to miss the single-rowed enter key in Office. In short: Even after a longer accommodation period, you still frequently make typos. You're armed against the one or other fit with an external keyboard. If you want to spend a lot of time in front of the integrated keyboard, you should keep a larger distance to the Medion Akoya X7811. Regardless of that, you'll unfortunately look for a keyboard light in vain. 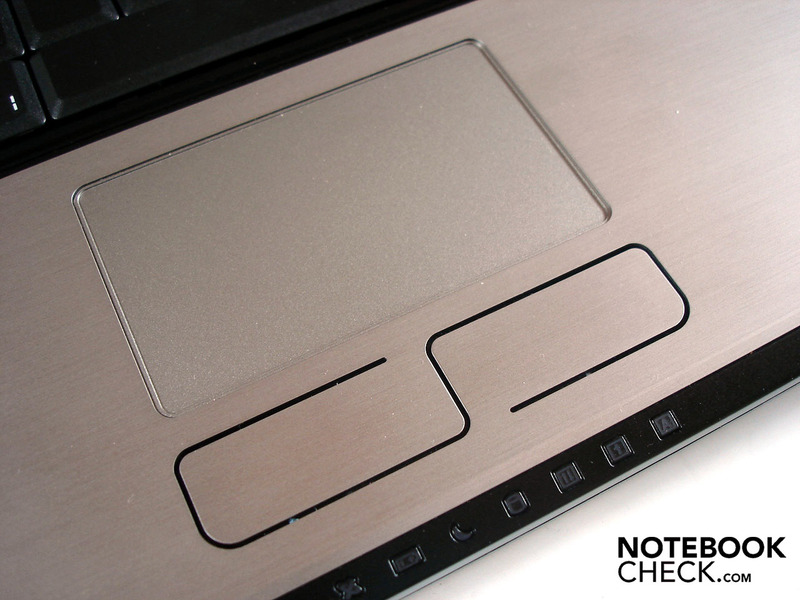 In return, the good touchpad can make up for it again. It could be a bit bigger in size and would be better placed a bit further right, but you can glide over the touchpad (can be disabled) quite pleasantly due to its fairly smooth surface, in return. A minimum of feedback is given due to it being slightly submerged, anyway. There id no reason for complaint in terms of precision and reliability. Furthermore, both mouse buttons are milled into the wrist-rest and can convince with a crisp and clearly defined pressure point. 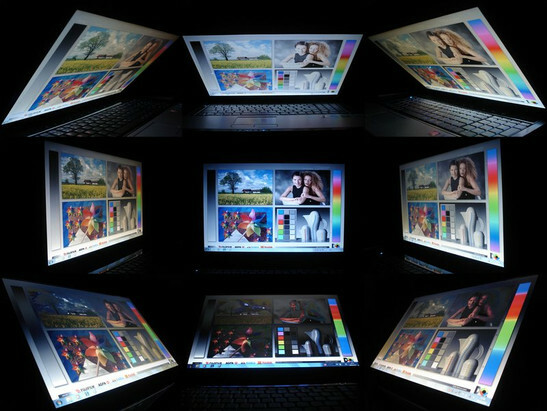 In opposition to the trend, Medion relies on a 16:10 format with a resolution of 1680x1050 pixels for its 17.0 inch display. In comparison to the frequently used 16:9 with a resolution of 1600x900, the user obtains a bit more desktop surface, which is noticed positively, especially in internet surfing and office tasks (i.e. with the Snap function of Windows 7). One thing first: The screen usually blends into an annoying green glimmer between loading processes or in other transitions. Now to the display rates. When you turn on the Medion Akoya X7811 for the first time, you'll notice the poor brightness right away. The image appears very pallid with its very low luminosity of 149.3 cd/m2. Therefore, the single colors are principally not really visible. The illumination of 77% could also be better. The lower edge of the display is - even visible for the naked eye - somewhat brighter than the other areas. In return, the very good black value of 0.18 cd/m2 has to be mentioned positively. It provides a saturated black, which scarcely drifts off into gray in dark areas/scenes or in the typical movie bars. Summarizing, it results in an excellent contrast of 811:1, which unfortunately can't disguise the poor display brightness, though. Movies and games aren't really much fun due to the average brightness. If possible, you shouldn't renounce the use of an external monitor. In using an external monitor you cleverly avoid a further disadvantage - the intense reflections that turn up due to the meanwhile (unfortunately) common high-gloss surface. If you don't exactly dwell in a basement suite all day, to do justice to the cliché, you'll also be faced with disagreeable reflections indoors during the daytime. Outdoors, you have to strain your eyes particularly to see anything at all on the display in sunlight. The Medion Akoya X7811 lines itself into the midfield in terms of viewing angle stability. Thus, the viewing angles on the horizontal plane are alright, but you shouldn't sit too transverse in front of the notebook, so not to be faced with a falsified image on the vertical plane. Fittingly to the potent graphic card, Medion had opted for a strong quad-core processor from Intel. The Core i7-720QM represents, so to say, the "starter model" of the Core i7 range and clocks with a low 1.60 GHz in its initial state. However, the clock rate can be boosted automatically up to 2.80 GHz with the turbo boost function. This overclocking is usually only enforced in lower load or when single cores are loaded. However, the turbo mode often remains disabled when everything is demanded from the cooling and the fan system due to a high load or when several cores are loaded. As a result, most games are currently still faster with a high clocked dual-core. But because more and more games have been benefiting from three or even four cores recently, and this trend will definitely become more common in the next few years, you will clearly have the greater future security with a quad-core. Thus, ambitioned gamers should without a doubt favor a quad-core CPU in the meantime. Back to the Core i7-720QM. With assistance from a technology called hyperthreading, the processor can manage up to eight thread at the same time, which isn't so important for gamers (at the moment). The quite generously sized L3 cache of six MB is more significant. However, it should be mentioned that the stronger i7-820QM and i7-920XM models can even fall back on an eight MB L3 cache. 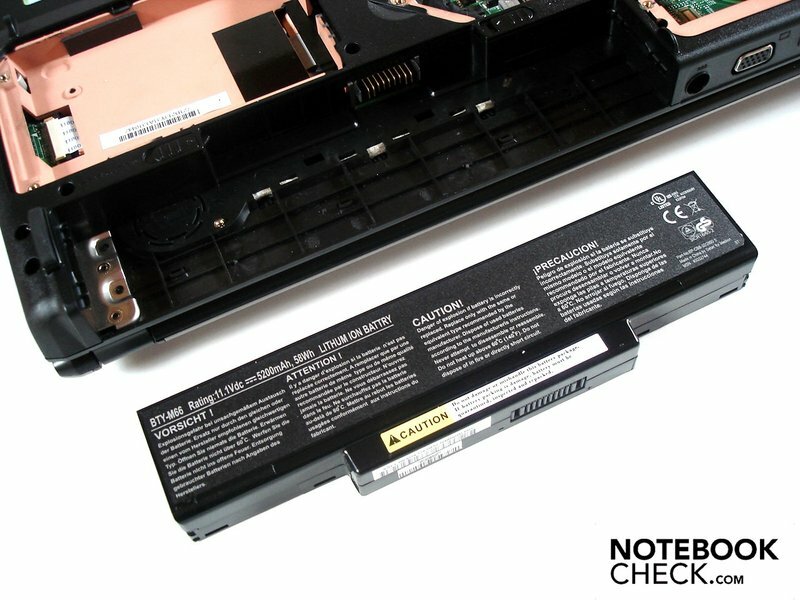 The Core i7-720 consumes a lot of power with a TDP of 45 watts, which naturally has a negative impact on the battery life. Apart from that, the processor, manufactured in 45 nm, can handle temperatures up to 100°C (Tjunction), although you of course shouldn't really force such temperatures in view of durability. A four GB DDR3 RAM (1066 MHz) that consists of two modules with 2048 MB each joins the processor. Incomprehensibly, Medion has only installed the 32 bit version of Windows 7 Home Premium. Thus, there are only about 3 GB of RAM available in practice. A 32 bit operating system might have a somewhat bigger hardware and driver compatibility, but the 64 bit design has long since begun its triumphal march. 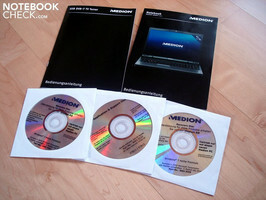 But because Medion has luckily included a DVD with the 64 bit version, you can remedy this condition yourself. 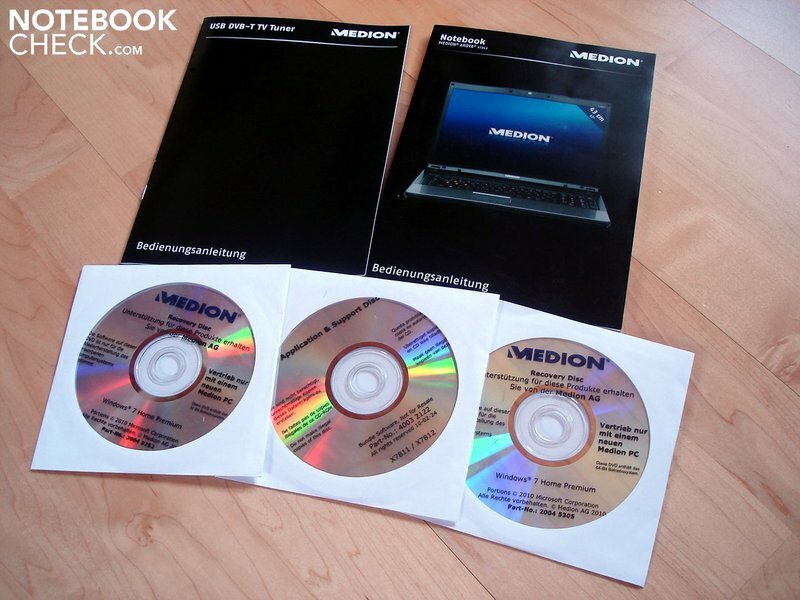 Medion is one of the first and also likely one of the few (if not the only) manufacturers that equips a notebook with the currently fastest single chip GPU, ATI Mobility Radeon HD 5870, for a price less than 1000 euro. In comparison to its predecessor, HD 4870, there haven't been many changes in the specifications (with exception of higher clock rates), but the Radeon HD 5870 can nevertheless convince with a very high performance. This is mainly due to the 800 unified shaders that the HD 5870 can dispose of. Because the 1024 MB graphic memory consists of a fast GDDR5 RAM, the quite narrow memory interface of 128 bits doesn't turn into a bottleneck, as it was the case, for example, in the previously built-in Radeon HD 5650 versions. The other details show themselves as more than impressive. Thus, the HD 5870 can serve with over a billion transistors (HD 5650: 627 million) and achieves an overall computing performance of a remarkable 1.12 TFLOPS. Clock rates of 700 MHz for the core and shader, as well as 1000 MHz for the memory appear insignificant, in comparison. The HD 5870 is manufactured in the cutting-edge 40nm process; the power consumption of up to 60 watts must be called extremely high (HD 5650: max. 19 watts). Nevertheless, ATI is, in terms of technology, a step ahead of the competitors from Nvidia with the DirectX 11 support, since Nvidia still has to go soliciting with DirectX 10. By the way, the HD 5870 positions itself a bit under the about 150 euro cheap HD 5770, in comparison to the desktop division. The Core i7-720QM can develop its full potential in the CPU-biased Cinebench R10. Whilst the single-core rendering leads to a good 3058 points, it's a remarkable 7809 points in multi-core rendering. Not even Intel's fastest dual-core, the Core i7-620M, can keep up with that. It "only" reaches 7575 points in multi-core rendering. The i7-720QM's would have turned out significantly higher with a 64 bit operating system and add up to about 10000 points (+28%) in multi-core rendering. The results of the graphic card in the popular 3DMarks present themselves just as impressive. The HD 5870 can distinguish itself evidently from its predecessor, the HD 4870. With 16349 points, the HD 4870 has to admit defeat to its successor, which has the lead by about 10% with 18048 points. The difference turns out even higher in 3DMark06 and the HD 5870 can distance itself by 18% with 12553 to 10655 points. Finally, an advantage of 24% is shown in the GPU score of 7616 to 6139 points. The HD 5870 computes about 17% faster than its predecessor, the 4870, In the synthetic application benchmarks. 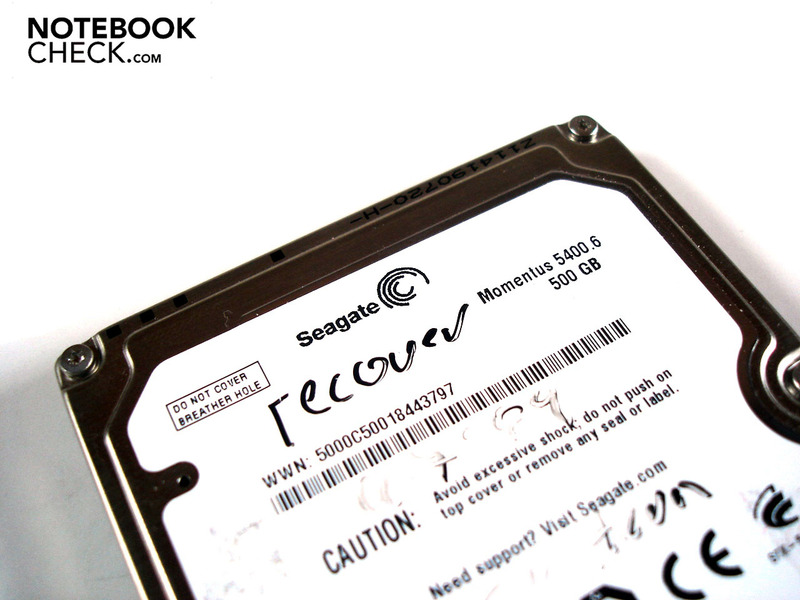 A 500 GB sized HDD from Seagate is used as the hard disk, which runs with 5400 rpm. The throughput rate of 61.8 MB/s is a bit low but the good transfer rate with an average of 60.4 MB/s is impressive. Medion has forgone on partitioning the hard disk (with exception of a 41 GB sized recovery partition). In the end, the user has about 435 GB available on the system partition. The application performance is awesome. 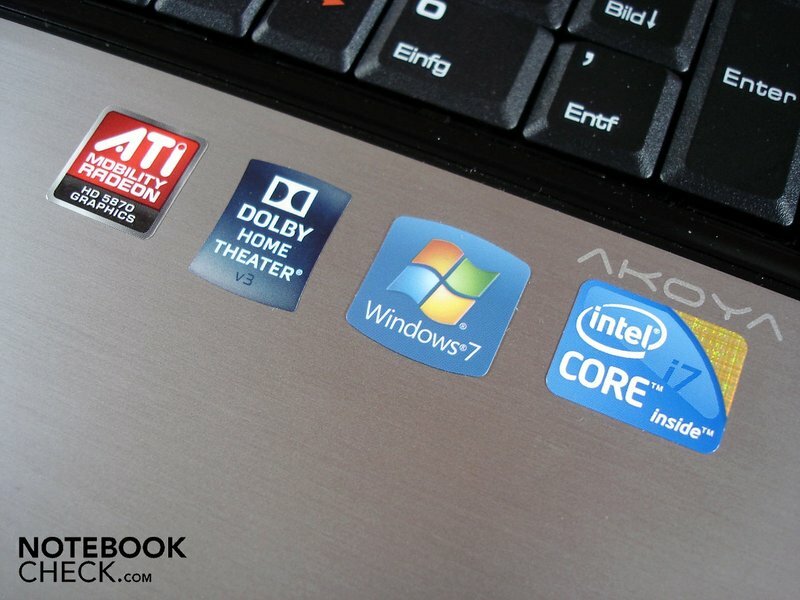 Intel's Core i7-720QM in combination with ATI's Mobility Radeon HD 5870 supplies an exceptionally high performance, which would have been even better with the use of a 64 bit operating system. Those who need as much CPU power as possible will be just as satisfied as users who need a strong graphic card for their applications. Note: All gaming benchmarks have been executed in the native resolution of 1680x1050. Furthermore, demanding settings have been selected in order to push the graphic card as close as possible to its limit. Because F.E.A.R. 2 already runs smoothly on midrange systems in higher quality setting, the Medion Akoya X7811 doesn't have any problems with Monoliths horror shooter. Thus, F.E.A.R. 2 can be played very pleasantly in maximum details (all on) and 4xAA with 74.3 fps. The newest story of Call of Duty's offshoot is, admittedly, scanty, but Modern Warfare 2 can - as usual - score with its atmosphere. The shooter is twice as much fun in high details (all on) and 4xAA due to a very good 53.2 fps. The latest battlefield part had to struggle with many technical inadequacies in the beginning. These haven't been completely eliminated, but the game runs a lot smoother in the meantime. Bad Company 2 also runs smoothly on the Medion Akoya X7811, where it achieves a good 43.6 fps in high details (HBAO on) and 4xAF. If the quality settings are increased to 4xAA and 8xAF, the game often slips into an unsmooth field of 36.9 fps. We've already spent a bit of time in the "underground" shooter Metro 2033 and are more than fascinated. 4A Games' initial creation sets new standards in terms of atmospheric density and detail richness. Unfortunately, the very good looks have to be paid for with high hardware requirements. Thus, the Radeon HD 5870 is overtaxed in the DirectX 11 mode (15.5 fps) as well as high details. And the game doesn't run very smooth even in DirectX 10 mode including high details, AAA and 4x AF with 28.1 fps, either. The user should either forgo on high details or be content with the DirectX 9 version because of this. The developer, Related Designs, has abolished one of the biggest critique points of Anno 1404 with the multi-player mode of the Venice add-on. The Medion Akoya X7811 coped perfectly with the main game in very high details and 4xAF: 60.9 fps are more than enough to (again) forget the time while colonizing leisurely. Need for Speed Shift manages to provide for an intensive race atmosphere, especially with its credible speed sensation, among other things. The chic sport cars can be adequately enjoyed in high details, including 4xAA, with 42.5 fps and force the opponents into the crash barrier. The role game, Risen can fascinate with an almost unlimited sense of freedom, even if this design option goes to the expense of the narrative quality. We stomped over the rainy beaches of the tutorial with the unnamed hero and beat down sea vultures in high details and 4xAF. Risen doesn't run ultra smooth with 34.1 fps, but the island mysteries can be solved, with little interruptions now and again, anyway. Collin McRae Dirt 2 is one of the first games available with DirectX 11 support. Because Dirt 2 can benefit from quad-core processors, you'll not find yourself in the next ditch in very high details and 4xAA, due to 32.1 fps. If you're expecting a completely smooth game, you should switch to the high detail level, which is then a good 36.8 fps. Crysis now has a serious competitor in Metro 2033 when it comes to forcing a notebook to its knees in terms of performance. You shouldn't even try the jungle shooter in very high details. Crysis jolts along unplayable even without AA or AF with 17.7 fps in the CPU and 19.6 fps in the GPU benchmark. On the other hand, the refresh rate can be denoted as good in high details with 29.0 fps in the CPU and 33.2 fps in the GPU benchmark. The given gaming performance doesn't need to hide from full-fledged desktop systems. They have a comparable performance for far less money, but lack any kind of mobility in return. But, back to Medion's Akoya X7811. All games we've tested could be played pleasantly in (very) high details. With exception of very hardware demanding tracks, such as Crysis, even quality enhancements, like antialiasing and/or anisotropic texture filtering, could usually be enabled. The verdict turns out ambiguous for the future decisive DirectX 11 performance. DirectX 11 will barely be a problem for a few games, like Dirt 2. The Radeon HD 5870 proves to be completely overtaxed with the extended effects in Metro 2033. 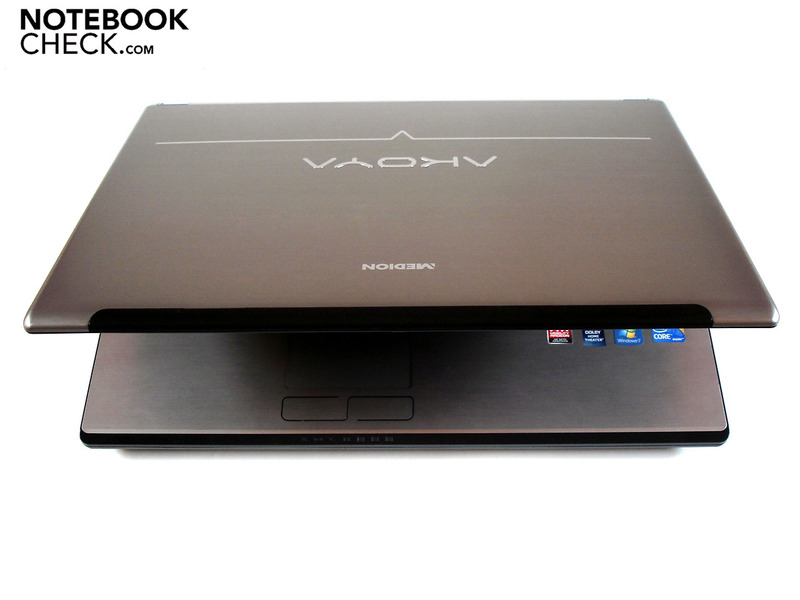 Nevertheless, you get a very strong system - for notebook conditions - with the Medion Akoya X7811, which guarantees a certain future security in interaction with the quad-core CPU. 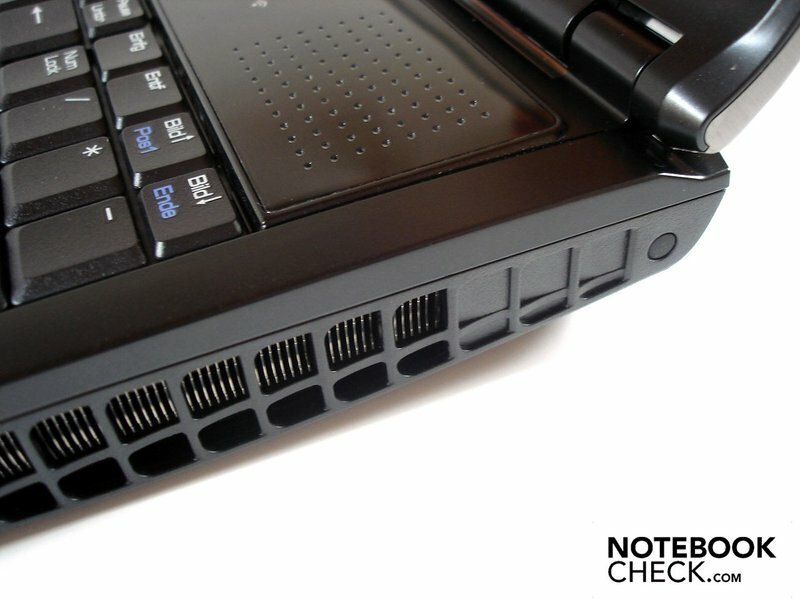 Gaming notebooks with high-end components are hardly known for a quiet operating noise. 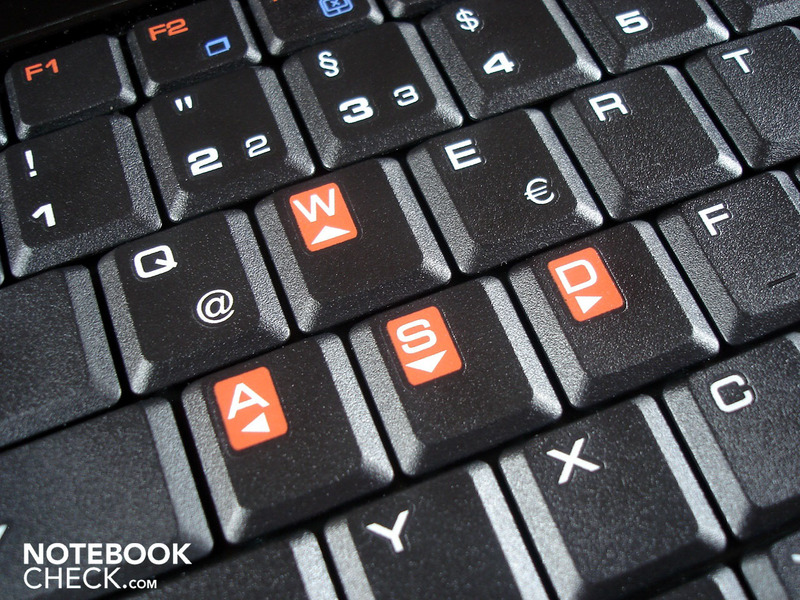 There are some positive exceptions, like the previously reviewed Asus G73. 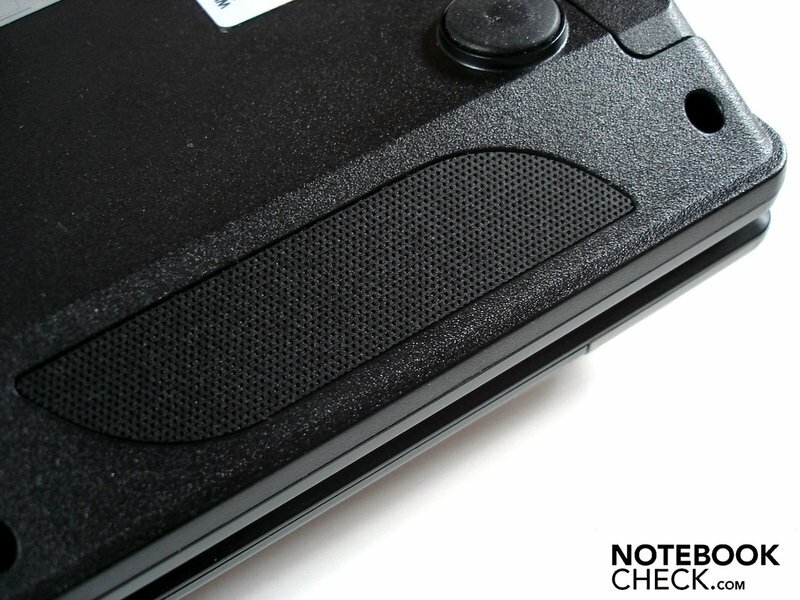 The majority of gaming notebooks aren't anything for weak natures in view of noise development. And, alas, even the Medion Akoya X7811 has to accept much criticism on this issue. The notebook is extremely loud and thus annoying under full load (Prime + Furmark) with 47.4 dB(A). Because a significantly lower load situation is created in gaming, the case fan is a bit quieter, but still very audible, with 40.6-44.4 dB(A). The fan might be drowned out in very loud games, as in shooters, but in quieter games, like in building strategies, the fan noise is very well present, though. However, in our opinion, the idle mode rather represents the main problem. The noise development of 36.5-37.9 dB(A) is noticeably lower, but the fan unfortunately changes its frequency range in idle mode often, which quickly proves to be extremely annoying and unpleasant. Furthermore, the hard disk let's itself be carried away by a typical clacking noise. The optical drive roars along audibly during data access, but in return, it's barely to be identified from the rest of the soundscape during DVD rendering with 37.6 dB(A). Basically, Medion's Akoya X7811 is just as loud as Clevo's W860CU barebone, if it's equipped with a Radeon HD 5870 (e.g. see Deviltech Devil 9700 DTX). At least the temperature development could convince us in idle mode. Whilst the case's bottom reaches up to 36.3°C, the upper side stays in a pleasant range with a maximum of 29.6°C. The surface temperatures increase considerably under load. The bottom partly heats up to 54.2°C (back right in the fan's area). Thus, the Medion Akoya X7811 could get unpleasant on the lap after a while. In comparison, the upper side stays a lot cooler with 39.0°C. The wrist-rest's left side stays in an absolutely cool field with a maximum of 25.7°C even under high load. Contrarily, the wrist-rest's right side provide for a slightly warm hand with up to 32.2°C. 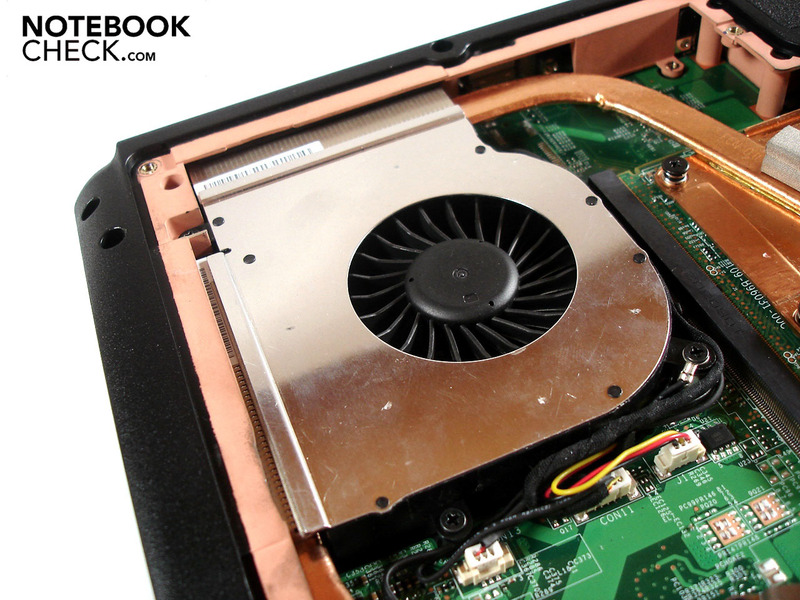 We could check the temperatures of all vital components inside of the Medion Akoya X7811. 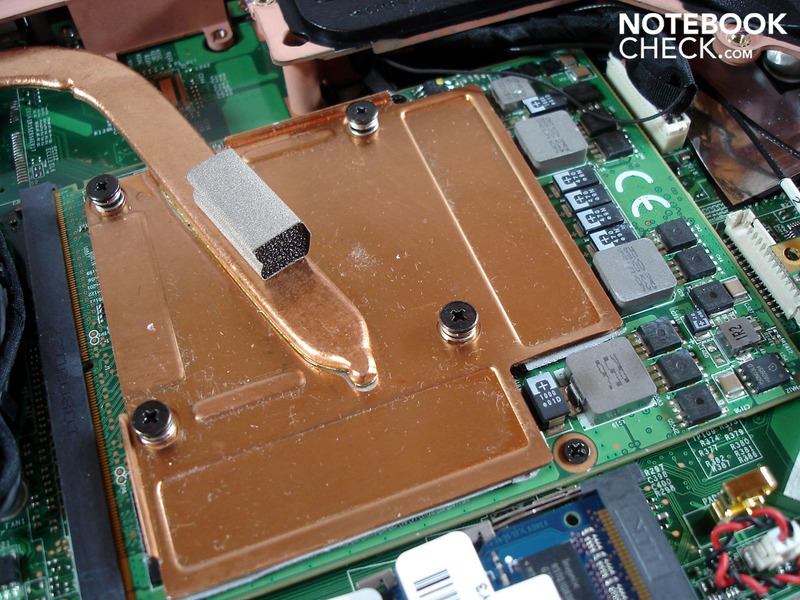 The hard disk is always outstandingly cooled with about 33°C. The processor stays in a reasonable field of about 58°C in idle mode. The temperature, however, increases to a high, but still acceptable 88°C under full load. 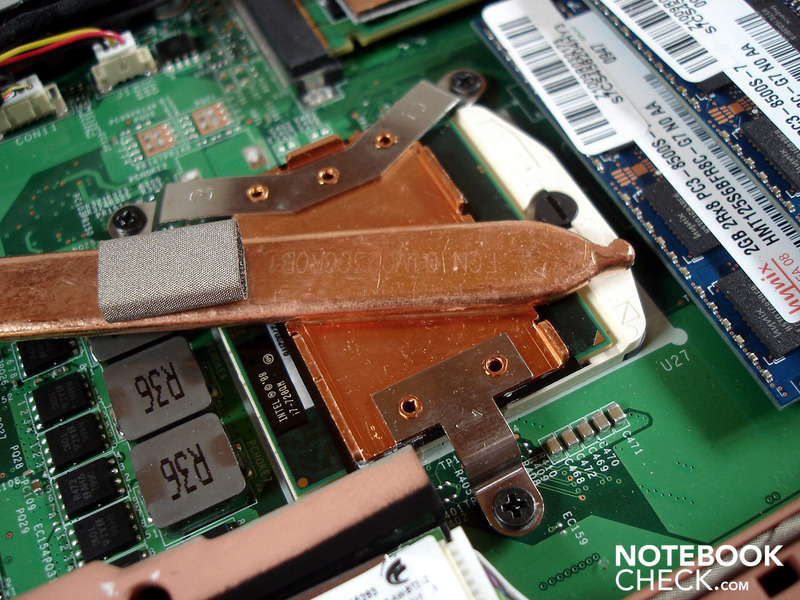 The graphic card isn't as fortunate, as it occasionally reached up to 94°C under extreme load. Such a temperature isn't, of course, exactly healthy on a longer term, but the graphic card settled to about 99°C in our endurance test (Furmark + Prime). Talking about endurance tests: We ran the Medion Akoya X7811 three times over several hours under full load. One time, the system crashed completely after about an hour. Not one single crash was recorded during the application or gaming benchmarks, though. It also didn't come to a throttling, that is a down clocking of single components, within the entire testing period. (+) The maximum temperature on the upper side is 39 °C / 102 F, compared to the average of 39.3 °C / 103 F, ranging from 21.6 to 68.8 °C for the class Gaming. We can certify the used sound system, which is made up of four loudspeakers and a subwoofer on the bottom, an adequate sound. The sound makes a somewhat dull and hollow impression and gets a bit imprecise under stronger load, but the high maximum volume and the Dolby Home Theater v3 support is convincing. Thus, the integrated "Audio Enhancer" function provides for a strong and dynamic sound, but unfortunately drowns the trebles in return. The sound appears less energetic and tinnier without the Audio Enhancer, in our opinion. Subjectively, the surround option didn't really lead to a change in the audio experience. A surround sound also didn't turn up. 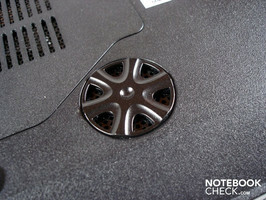 All in all, external loudspeakers aren't mandatory, but recommendable in the long run. High-end components aren't only reflected in a steep purchase cost but also in a high power consumption. Thus, the Medion Akoya X7811 treats itself to 47.9-64.9 already in idle mode, which is as much energy as many multimedia notebooks drain out of the mains. 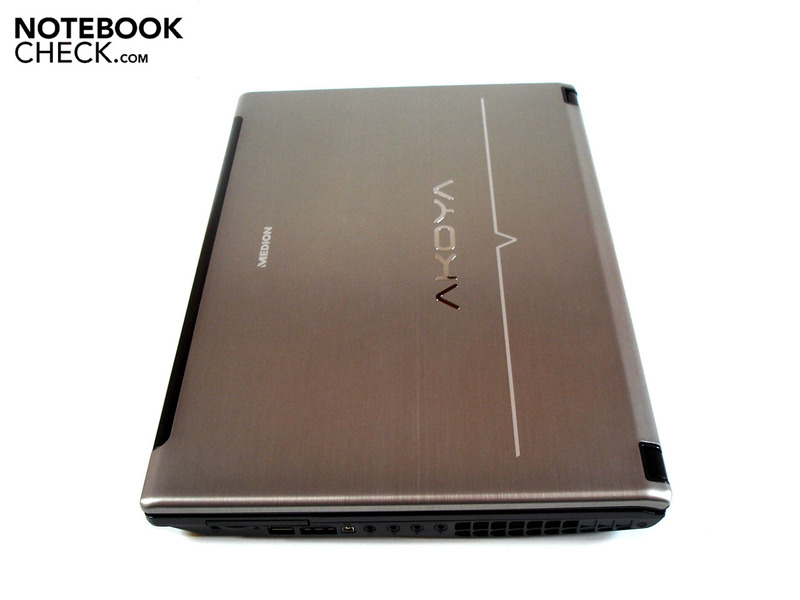 The gaming notebook consumes in following a high 123.4-166.3 watts under load. With this knowledge, it's not really surprising that the battery life is always disappointing regardless of the application scenario. Thus, the Medion Akoya X7811 is already exhausted after a meager 37 minutes under high load (BatteryEater's classic test) with maximum brightness and disabled energy savings options. The situation doesn't look much better with moderate energy savings options in DVD rendering with 50 minutes. The runtime first clings to an hour in internet surfing via the integrated WLAN. But the runtime proves to be abysmal even in BatteryEater's Reader's test with minimum brightness and maximum energy savings options with a runtime of 76 minutes. 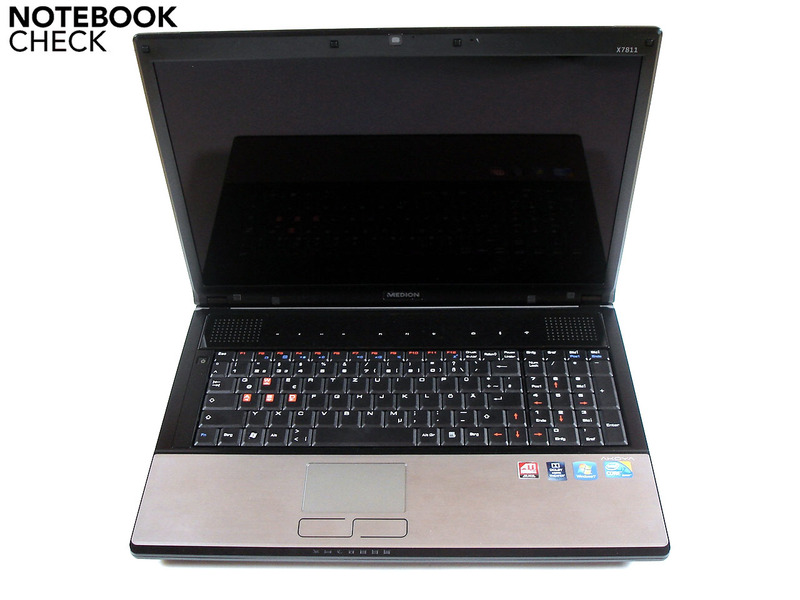 Medion has undoubtedly assembled a gaming notebook that is unrivaled in terms of its value for money ratio and which has a very high application and gaming performance. Unfortunately, this touchstone is at the expense of other, not less important, criteria. Thus, the battery life is always modest, the power consumption is very high, most components get very hot and the noise level under load is really not suitable for sensitive natures. The case choice also results in further critique points. For one thing, there is the dim display, the partly low case stability and the insufficient keyboard with its vague pressure point and its unsuccessful layout. The thing that bothers us most is the inconstant fan characteristic in idle mode. When a fan changes its frequency range every few seconds, it gets quite annoying in the long run. But the Medion X7811 also has its strengths. 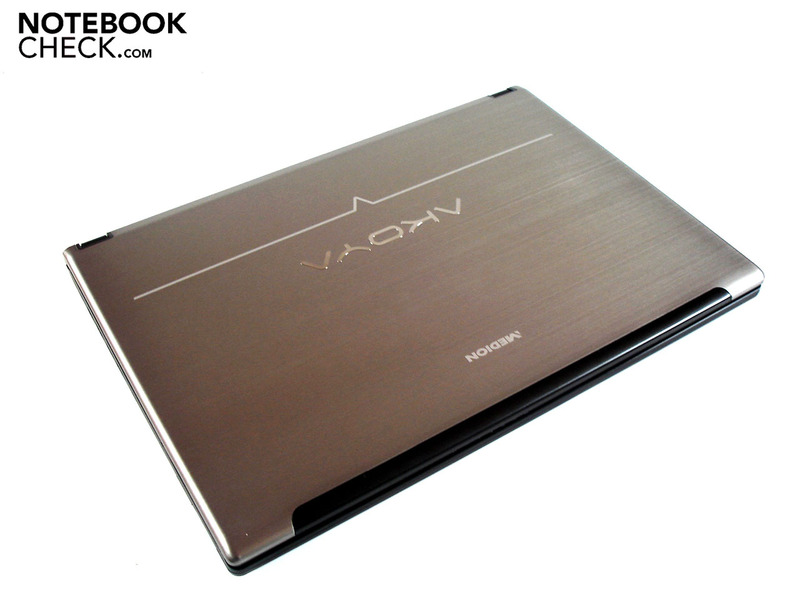 The high-end and smudge resistant surfaces of brushed aluminum, the good touchpad, the extensive connectivity and the lavish supplies included belong to this. Overall, we can only give the Medion a conditional purchase recommendation. 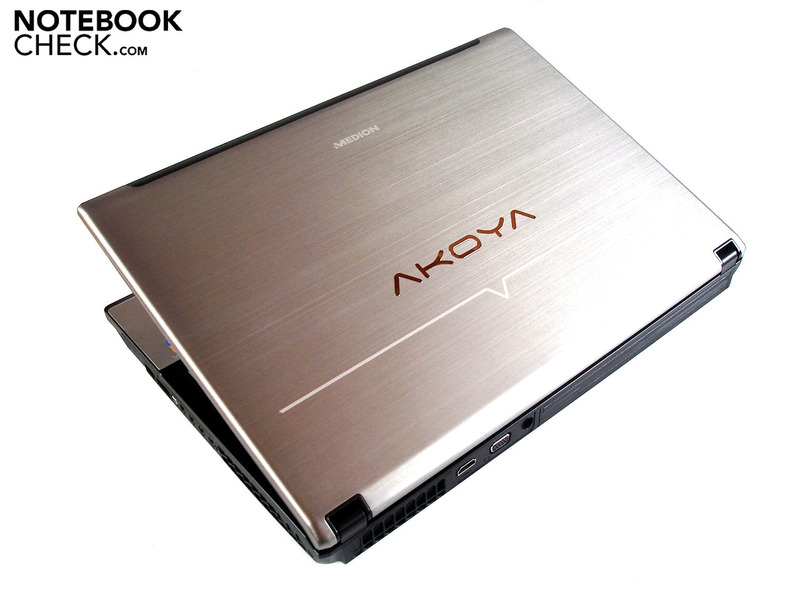 If you're looking for a gaming notebook that is as strong as possible and inexpensive at the same time, and if you don't have a problem with accepting numerous inadequacies, you could come to like the Akoya X7811. 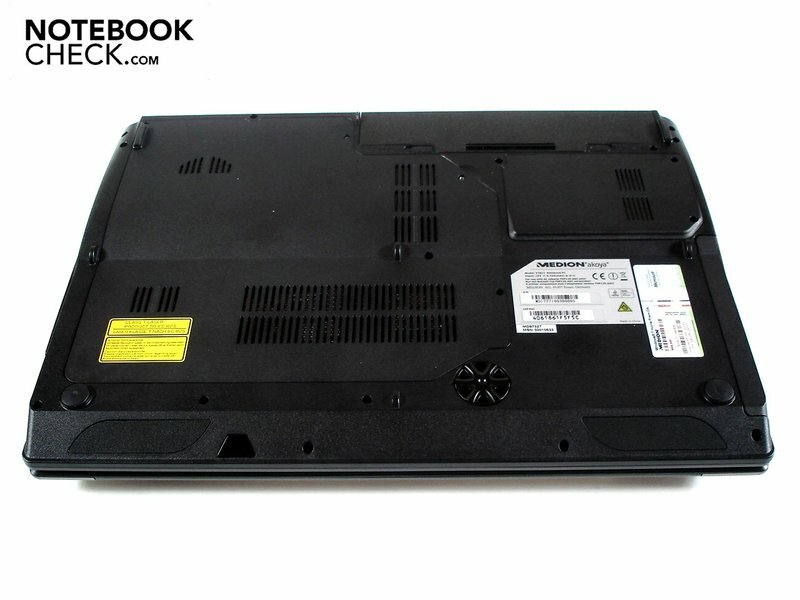 If you, however, prefer a - in all aspects - a balanced and high-quality gaming notebook, you should rather turn to the more expensive competitors, such as the Asus G73. 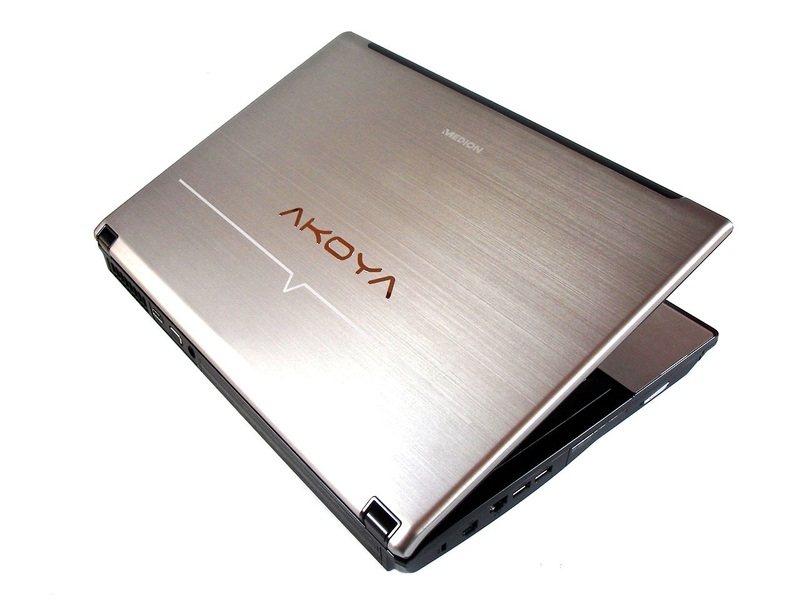 The Akoya X7811 is fairly light with about 3.2 kg in view of its size. ...and over the right side. The hinges can't prevent the display from shaking under vibrations. The power button has been placed somewhat adversely. 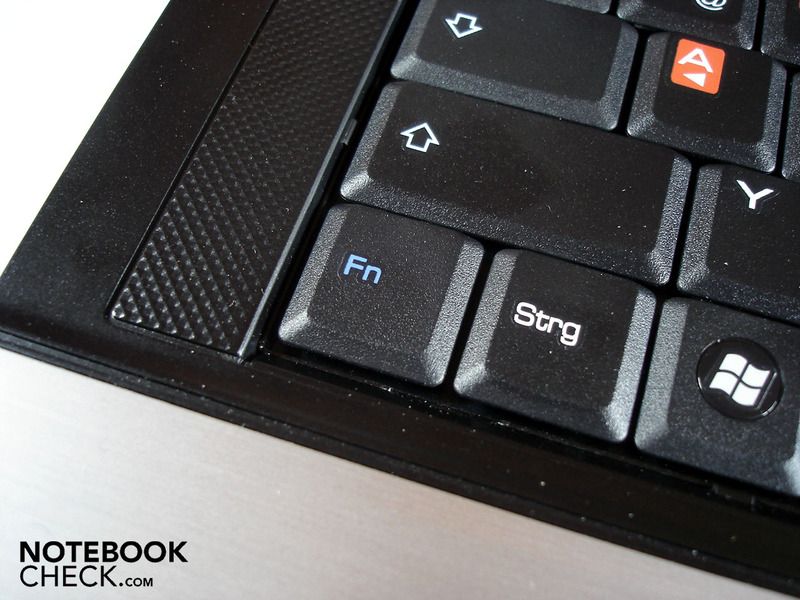 Gamers will often curse the FN key. Dolby Home Theater support adds to the sound quality. WASD markings designed for gamers. We would have preferred a keyboard light. 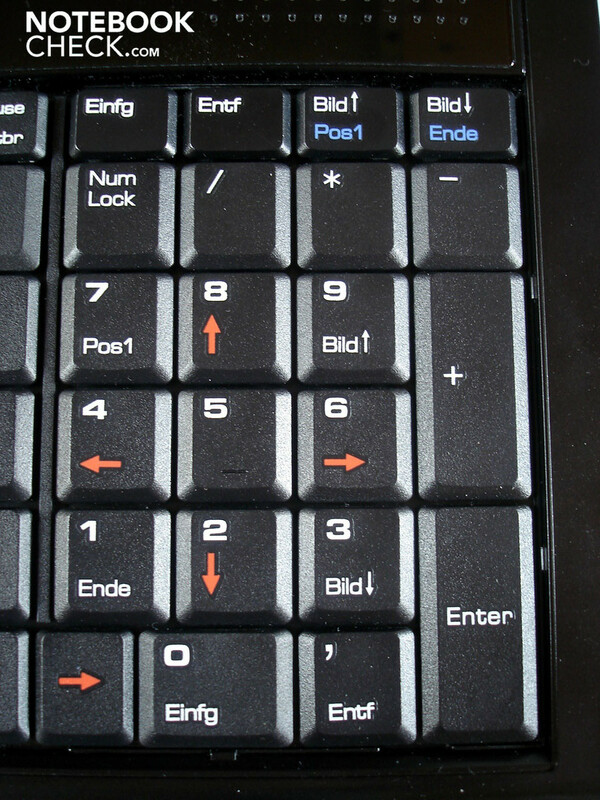 You always hit the wrong key due to the single-rowed "Enter". Incomprehensibly, a few keys deviate from the standard layout. 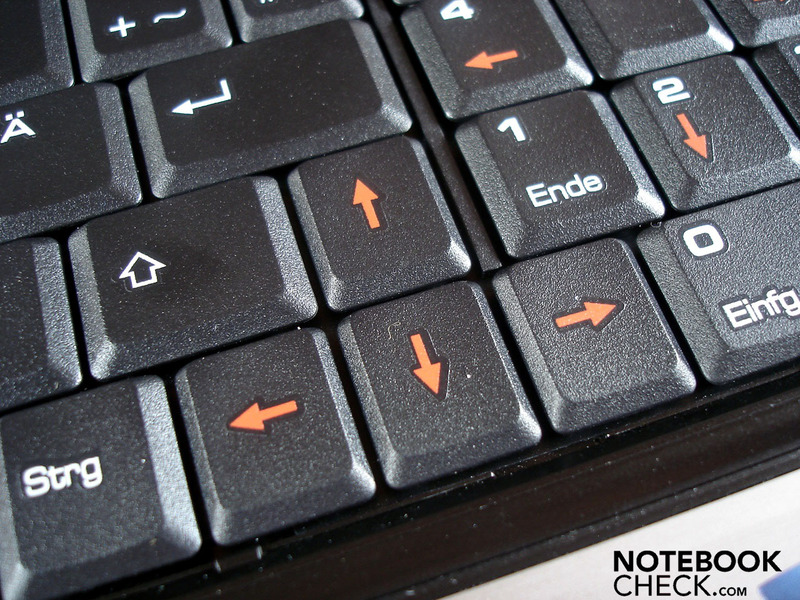 The arrow keys are also marked red. Numerous, expressive status LEDs are on the front. 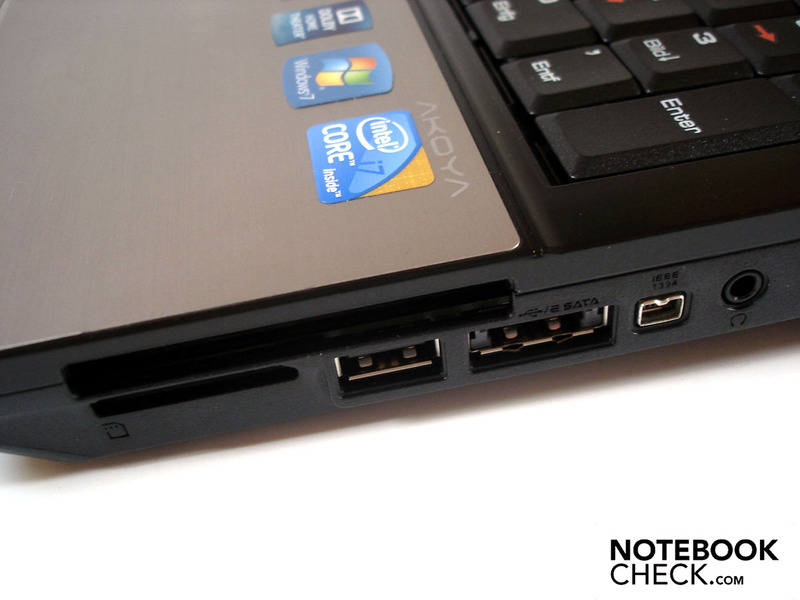 Other ports could be obstructed when the ExpressCard slot is occupied. Even a full-fledged surround system can be connected to the four audio outputs. 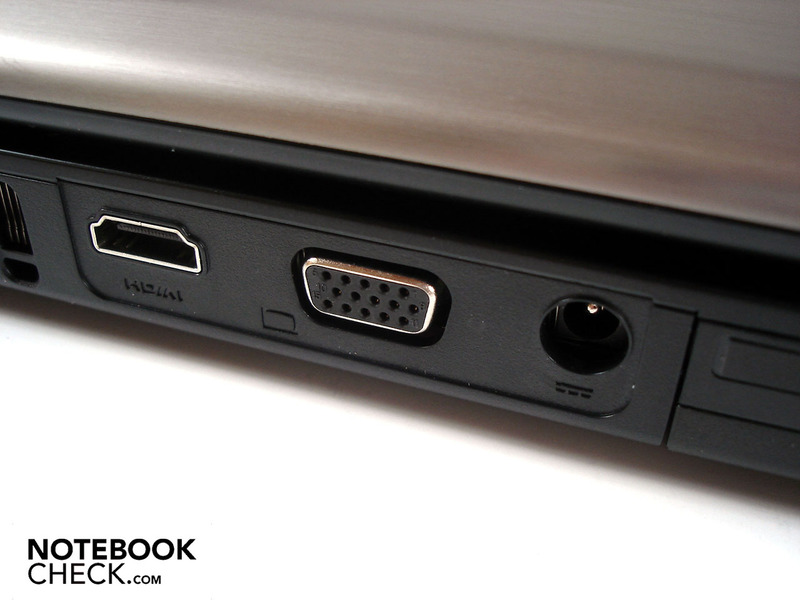 HDMI, VGA and DC-in are on the rear. 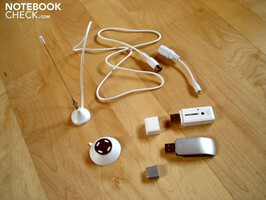 An infrared receiver for the included remote control is on the front. The port distribution on the left is, in our opinion, good. Medion has opted for a DVD burner as the optical drive. All corners are pleasantly rounded. 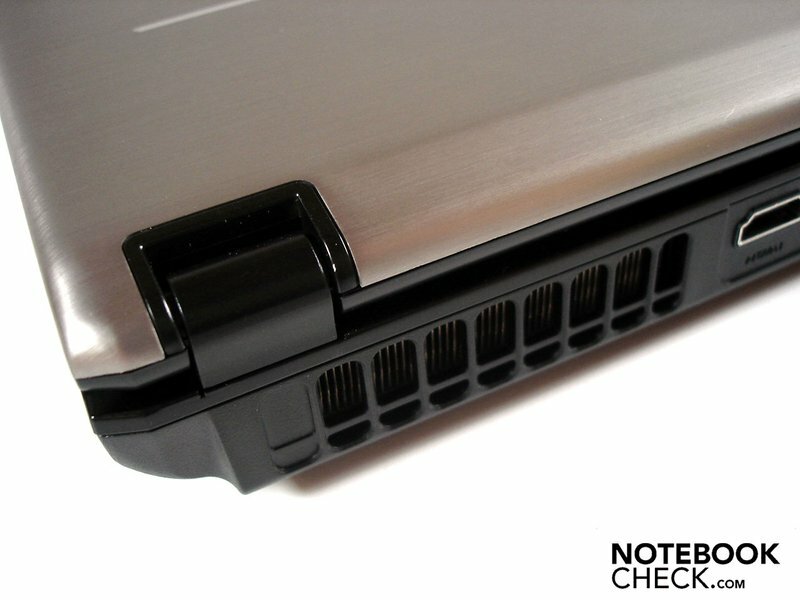 The notebook lid can be opened by 180°. The closing mechanism is magnetic. The silver surfaces of brushed aluminum make a very high-end impression. The base unit lifts obviously when it's opened. A chic Akoya logo adorns the display lid. All components, from the HDD over the RAM up to the CPU and GPU, are accessible. A single fan takes care of the hot-headed high-end component's waste heat. The Radeon HD 5870 takes up a lot of place in the case. 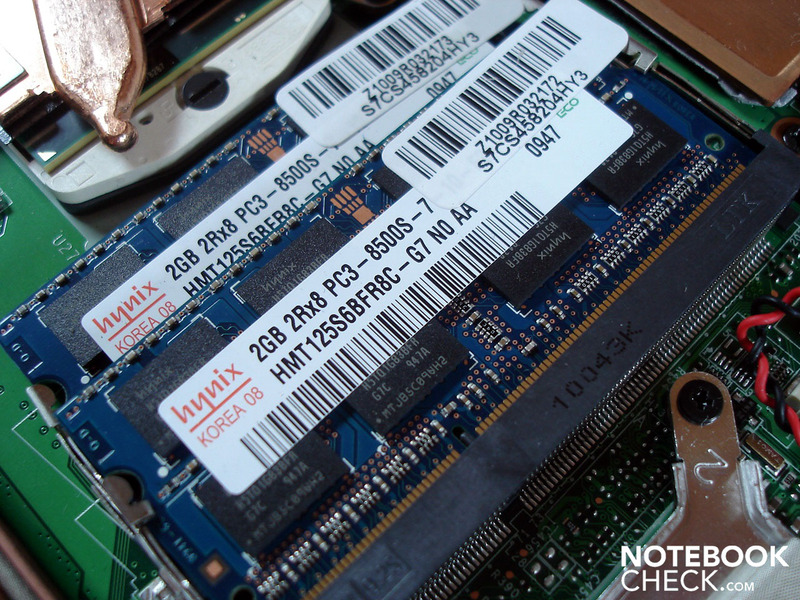 Two RAM modules with a 2048 MB DDR3 RAM each are already built-in. You're ready for the future with Intel's Core i7-720QM. Only one hard disk fits into the case, despite the 17.0 inch size. But it can be removed very easily. 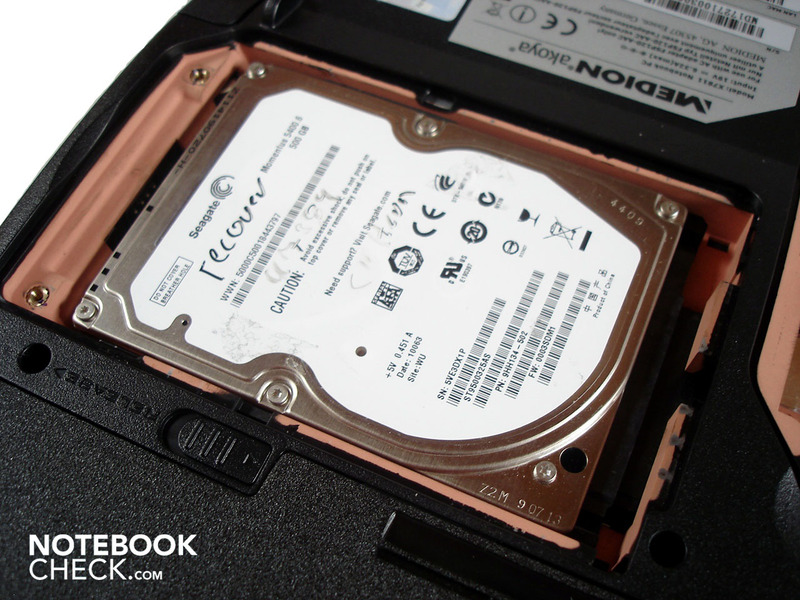 A 500 GB sized HDD with 5400 rpm is used as the hard disk. 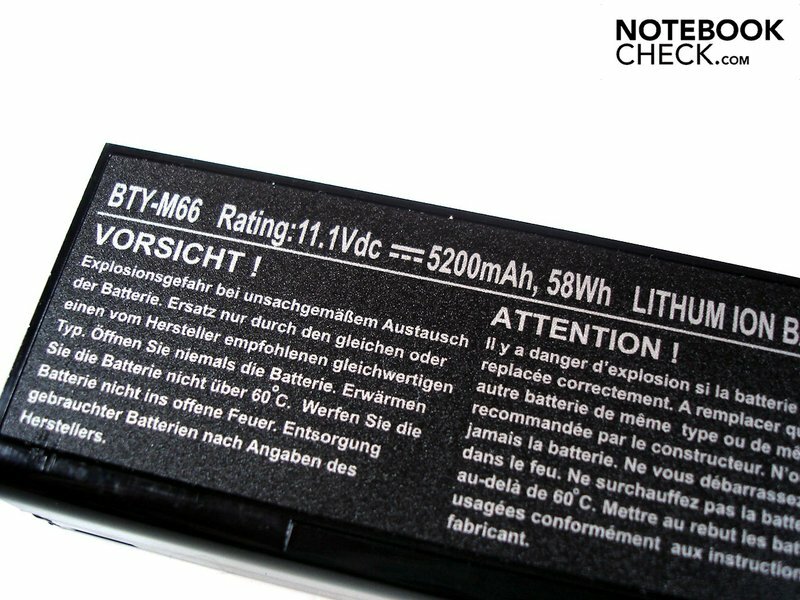 The battery is rather weak with 58 Wh. 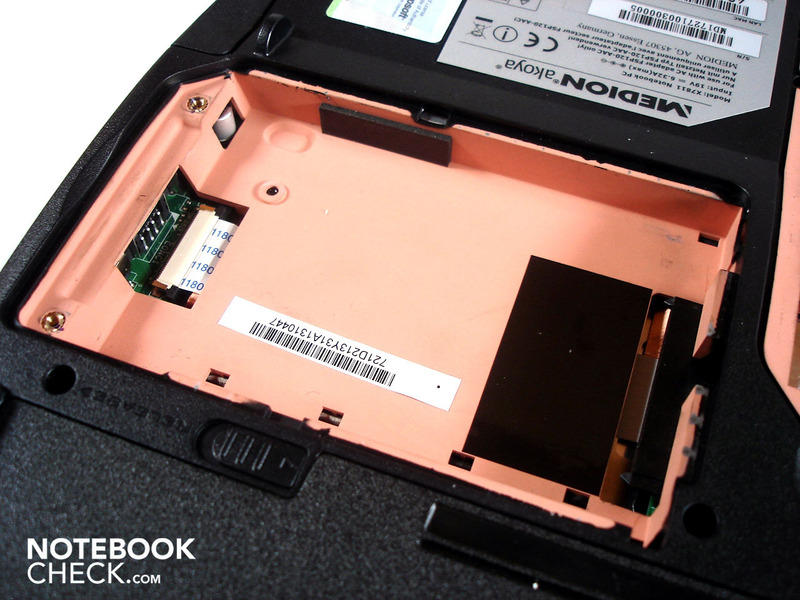 The battery can be inserted into the rear, which is practical. The big adapter gets extremely hot under load. The silver surfaces of brushed aluminum stand out very positively from the high-gloss plastic of other manufacturers. A more quiet and balanced fan that doesn't keep on changing its frequency. We've never had such a high gaming performance for less than 1000 euro. Other gaming notebooks with a Radeon HD 5870, like Asus' G73, Deviltech's Devil 9700 DTX,, Fragbook's DTS, CyberSystem's Si17/Si15, the mySN XMG7.c/XMG6, the Notebookguru's Fire i7/Storm i7 or the Hawkforce GameForce M17G/M15G.